It’s summer and so this post may not make sense, but what better time to begin to fight a national tradition than before it becomes necessary. So, here goes. As a former “soldier’s mother“, I’m making a request to all soldiers to put on your coat this winter. Before you say anything, let me explain. I get that you have to do this; I understand. No, wait, I don’t. I do respect that this is a macho thing. It’s a boy/man thing. You really think you should (or shouldn’t, as the case may be). But, OMG, stop. It’s stupid. Honest to God, listen to me, it’s stupid! For those who may have no idea what I’m writing about, let me explain. We are speaking of tradition here. 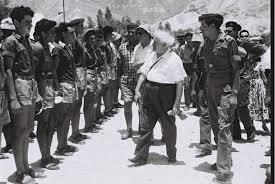 We are speaking about something that has been an integral part of the Israeli army since probably the first time Ben Gurion went to visit the troops (which was probably in the summer, but never mind); the time that Ariel Sharon stood with a bandage around his head in short sleeves (oh wait, that was summer too). 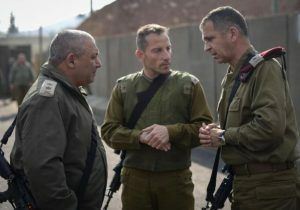 In Israeli society, or at least in the army, soldiers are united by a sense of serving together, of love for their fellow soldiers. When my youngest son entered the army, he worked hard and came home tired. Once, I heard his sister asked why he didn’t let some of the other boys carry work harder, while he did a bit less. My son looked surprised at her question and then realized he needed to explain. 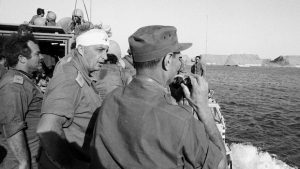 Israeli Ministry of Defense photo showing a young General Ariel (Arik) Sharon with his head wrapped in a bandage speaking to Moshe Dayan. Sharon was wounded on his head when he collided with a tank turret in the Egyptian Sinai campaign (which took place in the summer). “Haven’t you ever heard the term ‘mishpachat Tzahal’?” he asked her. The Tzahal (army) family. That is it in a nutshell. He wouldn’t work less so that others would work more. He would carry what he could, do what he had to do and I was very proud of him. And, he was an idiot. No, he wasn’t. Really. What he was…like his brothers before him…was a combat soldier. As united as the army is, it is also divided into units — this serves the army as each soldier is trained within a unit to do what the army needs as a whole. They don’t only need ground forces or artillery, tanks or an air force. They need huge numbers of support troops (everything from instructors, drivers, medics, cooks, warehouse personnel, guards), and so the boys (and girls!) are sent to units, each having a particular job during war…and during the non-war periods (because, in 70 years and counting, we’ve never had peace). In a larger sense, the army is divided into two categories, often known as either kravi (combat) or jobnik (support for combat). 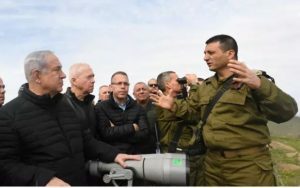 It’s a silly way to define the largest part of the army; there are way more non-combat positions than kravi and without question, the army could not function for a single day without these non-combat roles. Still, there is, unfairly, an “aura” about the combat soldier in Israel. Each of my sons was asked — will you serve in a combat unit…each answered yes. Without a doubt, I’m very proud of them…and they’re all idiots. No, they’re not. But each time he was released, he made his way home on what were, in many cases, the coldest, wettest storms of the year and each time, I’ll bet you anything, he wasn’t wearing a coat. You see, dear friends, there are things that kravi do and things that jobniks do…go figure. Jobniks pin their beret to their shoulders rather than rely on the loop of the uniform to hold it in place. Kravi don’t do that because…well, they’re kravi. Um…I’m with the jobniks on this one. Pin the beret and we won’t have to buy new ones or go out trying to find the one that fell off! Jobniks have subtle differences about their uniform — many don’t have to wear combat boots…and apparently, “only jobniks wear coats” over their “dress” uniforms. Dress uniforms are worn for ceremonies, but they are also worn to and from the home. Some how it’s a “thing” for the army to look it’s best when it travels to and from buses. So the uniforms they wear are made not to wrinkle, are thinner rather than the normal uniforms. Those wrinkle like crazy, are much more comfortable, stronger, thicker, meant for working in, etc. Jobniks wear their sleeves unrolled in the winter to keep their arms warm…what a concept. Kravi wear the sleeves rolled up (or most of them do)…because…because…because they’re idiots. No, they’re not, but I’m still with the jobniks on this one as I sit each winter with three layers on and all my sleeves rolled down looking at those combat soldiers on the buses and trains – no coats, sleeves rolled up. Tell me they don’t look cold! And really, don’t blame the army for this one. Apparently, combat soldiers are given not one, but TWO different coats. One is a dress one they almost never wear and the second is a fleece that they wear on base and when they finish the army. So, as August turns to September and the nights begin to get cold, soon you’ll begin to see our young combat soldiers, brave enough to risk the wind and the rain and the cold, while they shiver and rush between the rain drops to get home. They’re idiots. Yes, they are. It’s cold out and before you start coughing, wear your coat this winter. Absolutely, this is one tradition to break! Put on the damn coat! I don’t understand, why the title had to have a cuss word in it….that’s just wrong, and NOT Christ-like! With all due respect, it has never been one of my goals to be “Christ-like”. I appreciate your comment and if you knew more about Israeli culture and the culture of the army, you’d understand. You do know that it won’t happen, don’t you? A mother can hope…I mean, really. Is it so hard to put on a coat? I’m not even asking them, God forbid, to BUTTON it…just…just wear it.